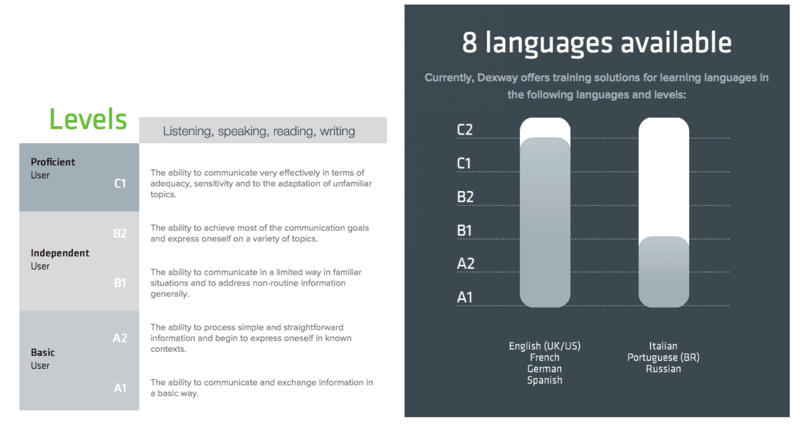 Dexway course levels and tests correspond to the levels specified by the Common European Framework of Reference for Languages (CEFR), the standard system used in Europe, and which is increasingly being used in other countries to measure the level of understanding, speaking, and writing of languages and levels. In order to facilitate learning a new language at the beginner levels, all the courses include interactive course help for the student available in 11 languages: French, English, Spanish, German, Russian, Portuguese, Chinese, Arabic, Polish, Greek and Danish. The student can see the interface of the course, receive interactive help in each exercise, access the course manuals and more, in their native language if desired.